The Flying Marinos, headlining the VFW benefit. Left to right Bill Pierucci (on drums), Gary Wood, Bev Marino, and Lou Marino. Move over, BuckO, there's a new museum in town. Bakersfield is, of course, home to the Buck Owens Crystal Palace, a music hall built by Owens in the 1990s. It also houses a restaurant, a nightclub, a bar, and the Buck Owens Museum, a collection of guitars and other memorabilia belonging to the country music hit-maker, whose career spanned more than 60 years. While Owens may be the city's best-known country artist, it took a village to create the Bakersfield Sound, an amalgamation of raw Depression-era laments, rhythmic honky-tonk, up-tempo Western swing, and a touch of rock-and-roll, powered by electric amplifiers and a sturdy backbeat, all decked out in rhinestones and fringe. Tommy Hayes, at 86 one of the last surviving musicians who created the Bakersfield Sound, joined the Flying Marinos for a few tunes. 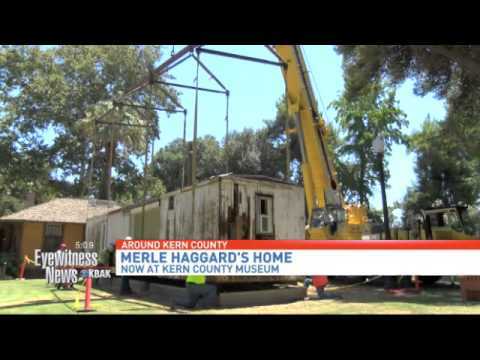 Haggard was born and raised in a railroad boxcar, which will make its debut at Pioneer Village during the festivities. The Village features more than 50 historic structures, including the Kern County Museum with its permanent Bakersfield Sound exhibit. Preserving the boxcar has been a community enterprise, with musicians and fans raising money to make the exhibit a reality. Last month, the Flying Marinos took to the stage at the VFW Hall for a benefit performance, with proceeds going to restoration of the boxcar. One supporter called the museum, and the festival, a "gift to the man who gave us so much through his music." For more information, visit the Pioneer Village website.